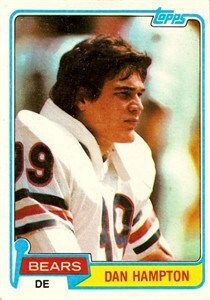 1981 Topps Rookie Card of Chicago Bears Hall of Fame defensive end Dan Hampton. About Ex condition, off-centered with corner wear. ONLY ONE AVAILABLE FOR SALE.